Looking for a stylish, practical crossbody bag that stands up to everyday use? This one won't disappoint, with room for all your essentials and a comfortable design. Are you fed up with crossbody bags that are too bulky, lack sufficient storage, and wear out far too quickly? We've remedied this common complaint with the NeatPack Crossbody Bag. This is a bag that not only looks fabulous on you; it makes life so much easier. No more worrying about pickpockets and identity thieves; your bag was designed with security in mind. It features a main compartment with an RFID zip pocket for storing a passport & credit cards. As an added safety measure, you can lock the compartment's two zippers together. 3 front exterior pockets (2 zippered, one slide-in): For easy access to sunglasses, cell phone, and other devices. Main compartment: Offers ample storage space for books, light clothing, hats, & more. Zippered anti-theft pocket inside as well as 2 open pockets for coins & other small items. Water bottle side pocket: Slip your drink into the secure pocket so it's right at your fingertips. No need to stash it inside the bag and worry about spills. Back pocket: With a Velcro closure, this pocket is ideal for an iPad or other small tablet. In addition to sturdy, top-quality zippers that won't break off in your hand, the NeatPack Crossbody Bag is made of rugged, weather-resistant nylon that's easy to clean. Going on a day trip? 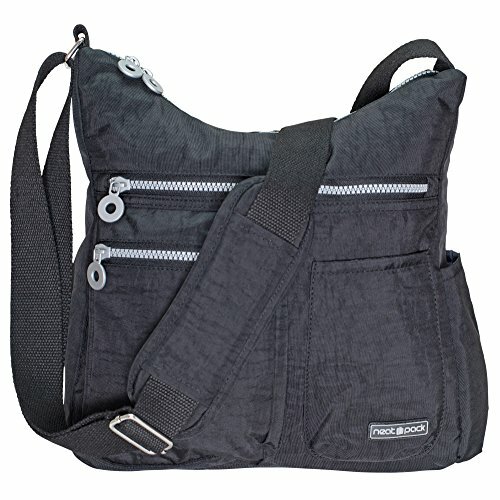 With its adjustable padded shoulder strap, the NeatPack Crossbody Bag can be worn comfortably for hours. It's ideal for busy moms, college students, professionals, tourists, and anyone else who's constantly on the go. 100% Lifetime Money-Back Guarantee: Your travel crossbody bag is backed by our rock-solid lifetime guarantee (just register on our website to claim it). Buy this product without risk.